New exercise equipment is being arranged, the pool is being filled, and in a little less than two weeks, Springmoor’s Pathways Wellness Center will be open to residents and their guests! And it couldn’t be happening at a better time. With summer (hopefully) around the corner, many of us are not only thinking about exercise, we are watching our diets, too. A grand opening celebration is planned for March 25 from 2:30 p.m. to 4:30 p.m., where attendees can savor a healthy spread of carved tenderloin sliders, shrimp, fruit skewers, cheese, individual fruit parfaits, and fruit salsa. We’ll also have a ribbon cutting ceremony and several wellness demonstrations throughout the new center. 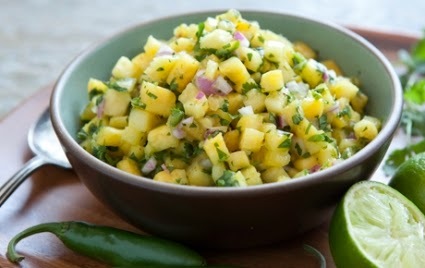 In the meantime, enjoy this recipe from Whole Foods Market for “Fresh Pineapple Salsa.” Freshly-diced pineapple takes the place of tomato in this sweet twist on a Mexican favorite that is delicious with tortilla chips. Or for a quick and healthy dinner, use it to top your favorite grilled seafood. Toss all ingredients together in a large bowl. Set aside for 30 minutes to let flavors mingle before serving.